Home » Blog » News » I,Q Two Final #44. League City Intermediate & Ferguson Elementary. Gary Brown. Texas. I,Q Two Final #44. League City Intermediate & Ferguson Elementary. Gary Brown. Texas. Yep… I’m up again early working on IQ2. For those who aren’t writers this must be getting a bit repetitive. But this is what it takes to write a novel. You have to show up everyday, and if your busy, or on the road like I am, you have to fit your writing in when you can. 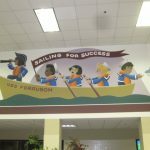 After I finish writing this morning I’m off to League City Intermediate and Ferguson Elementary. Gary Brown is the librarian at Ferguson and he put this Texas tour together for all the other schools. It’s a difficult job to coordinate an author visit for nine schools. In fact, it can be difficult to set up a visit for one school. Gary Started at the library in 1990 (the same year my first book got published “Sea Otter Rescue). He has set up 2 or 3 author a visits a year for several schools for 20 years! He does it because he thinks it’s important to get authors face to face with students. Obviously Gary is a a super librarian. Thank you for setting this up for me Gary! Thank you for your years of dedication to children’s literature and your students.